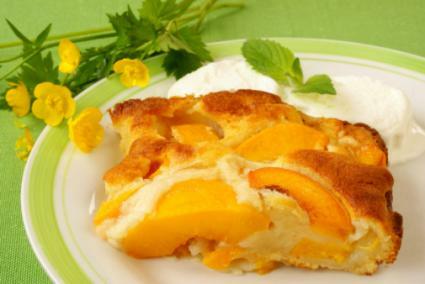 Peach cobbler is one of those comfort foods that makes a wonderful accompaniment to a home-cooked meal. Luckily, it's a simple and satisfying dish to make. Canned peaches make this recipe especially quick and easy to assemble. It takes about 10 minutes to prepare for the oven and will serve about eight people. Place the butter in a two quart baking dish and put it in the oven to melt. Keep an eye on it while you mix the batter and remove the dish from the oven as soon as the butter melts to avoid burning. In a mixing bowl, gently stir together the flour, sugar, baking powder, and cinnamon. Pour the milk and vanilla into the flour mixture and stir until combined. Scrape the batter into the baking dish over the butter. The butter will keep the cobbler from sticking and give it a richer flavor. Slowly pour about half the syrup from the peaches evenly over the surface of the batter as you hold back the peach slices with a spoon. Then add the peaches by spoonfuls to make sure they're distributed evenly and discard the rest of the syrup. Sprinkle the two tablespoons of sugar over the peaches and batter. Bake for approximately 40 minutes or until the cobbler is golden. Serve the cobbler warm or cool with a dollop of whipped cream or vanilla ice cream if you like. You can substitute fresh, ripe peaches for the canned peaches in this recipe if you prefer, but it will add time and extra work to your preparations. Combine the peaches, sugar, water and lemon juice in a saucepan and stir. Bring the mixture to a boil and then simmer for about five minutes. Remove from the heat. Follow the recipe above preparing the batter as directed, and spoon the fresh peach mixture evenly on top. Bake as directed until the cobbler is golden. Peaches go well with berries. For a quick variation that requires no other adjustments to the original recipe, sprinkle 1/2 cup of berries over the batter right before you add the peaches. This cobbler is bound to become a favorite once you've tried it. Since it's so easy to make, you can whip up a batch for family dinners or make a couple batches to share at potlucks. It's a dessert that will be welcome on any table at any time.